In the midst of our busy work schedule after our marriage, my wife Peggy and I put in much effort to start a family. Eventually, to our great joy, my son Jia Jian came along. He was born premature, at seven-and-a-half months, with chronic lung problems. In those stressful five months immediately after his birth, I had to shuttle between work, home and the hospital on an almost daily basis. Twice, Jia Jian was warded in the Intensive Care Unit and we nearly lost him. It was a very difficult time for us. The experience of sitting helplessly in the hospital with my son as he struggled to breathe in the incubator strengthened my resolve to be a dad who would always actively be there in his life, so that I would not miss out on anything. It is much easier to be a hands-on father when the children are in their pre-primary years. Be it changing diapers or bathing my son, I think I did quite well sharing the joys of parenthood with Peggy. But when Jia Jian was due for primary school, I thought at first that the best father would be the one who made sure he studied for his spelling tests and taught him how to solve challenging mathematics problems. Then I joined the Parent Support Group at Tampines Primary School (TPS) – and it opened a whole new world of fatherhood to me. Organising weekend activities like sleepovers at school and CCA bazaars showed me the many different ways that fathers can be there for their kids. Later, I was nominated to head the team to run TPS Fathers@Schools group. Fathers@Schools is a programme under the National Family Council’s Dads for Life movement. One of the first events I organised for the dads at TPS was a viewing of Father’s Love, a skit by theVoice, which touched on how the values and traditions of fathering are passed down from generation to generation. From my own experience, the reality is that, while many fathers want to be good fathers, we are quite clueless about how to go about it. From our own fathers, we learn that dads are meant to be the disciplinarians and sole breadwinners. But fatherhood of the past may not be enough in this day and age. While many mothers bone up on knowledge from motherhood websites and magazines, there is a lot less literature out there for fathers to learn from. The staging of Father’s Love demonstrated this. One appreciative dad afterwards wrote to me sharing how the skit had helped bridge the distance between him and his Primary 2 daughter. She had never had much to share with him, he told me, and they seldom spoke beyond talking about what to have for dinner and how she did in her school tests. But after watching the play, when his young daughter took the initiative to have simple chats with him about her school life, he began to put in a concerted effort to give her his time and build their relationship. Then there was John (not his real name), a Primary 4 student known for being mischievous in class. When his dad joined him in a Father-Child Experiential Camp, we saw an immediate change in him. And after his father became more involved in his school life, John’s teachers reported an improvement in his conduct in class as well. Certainly, being involved in my son’s school has helped me understand him much better. While helping him with his schoolwork is still largely Peggy’s area of expertise, I’m glad to say that I help him build character and confidence by passing on some of my life lessons, including time management, focus and self-sufficiency. One of the big things I look forward to on the weekends is when we sit down to discuss his aims for the week and how much time he should spend on achieving them. Balancing my involvement in TPS and my job has not been easy. I’m glad to say that my immediate supervisor and peers are very understanding of what I do for the school. Peggy has also benefited from my active fatherhood. It has allowed her to take time out to attend personal development classes as she aims to re-enter the working world. I believe our shared parenting responsibility gives her the assurance that this is a partnership and not just a journey she makes alone. My biggest motivator is Jia Jian. I often overhear him telling his classmates about how I am involved in organising a particular school event. Recently at a camp at The Float@Marina, he said that, although his father was busy, he always made an effort to sit and talk with him, and that made him happy. To me, the twinkle in my son’s eyes when we take part in activities together is the best reward and what really counts in my fatherhood journey. This article, Hail the New-age Hands-on Dad -Being involved in your child’s life changes you both, was first published in TODAY on 20 May 2012 and is reproduced with permission. 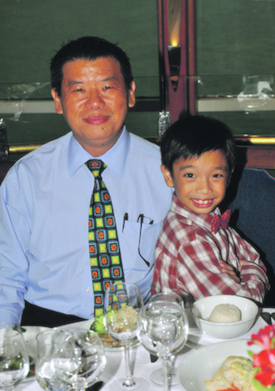 About the Author: Billy Ng, father of one, was appointed Fathers@Schools Ambassador, along with 20 other volunteers, to help schools set up their own fathers’ groups and to spread the message of active fatherhood.